“Humanity Evolve!” is about creating a forum for a discussion and knowledge exchange about how to thrive in today’s world and be part of creating a positive future for yourself, your family, community and the world. Each show features an open and informed conversation around women, technology and emerging trends that fast track you to a new level of performance and understanding that positively changes the world. You’ll be inspired by learning simple ways to alleviate struggles and be a better human being. You will learn about new technologies and innovations with a dynamic entertaining conversation, and we’ll engage in dynamic and interactive dialogues. Catherine brings her expansive network of friends including global leaders, technologists and experts to share collective wisdom. These unique insights that made a difference for Catherine helps you on your life journey to be your best self. From the impact of the Solar Eclipse viewing across North America to DNA Ancestry testing to Innovations in HealthTech, technology creates a unique shared experience and personal insight for all of us. Encore: Women and Investment: Create Exponential Growth! Do you want to grow your business? Are you a women entrepreneur or work with women leaders? Do you want to mentor or advise women led organizations? Yes, You Can Make a Difference to Save Our Oceans! Yes, the long-term trend shows that the oceans have become warmer since 1955 (NOAA). Coral reefs around the world are vanishing at an unprecedented rate. What can people do, in the moment, to decrease stress and perform at their best? Transforming stress and anxiety can be a simple as taking a mindful breath. Are you an entrepreneur or investor Interested in unique strategies to rapidly growth your business? In this episode of Humanity Evolve!, Sramana Mitra and I share global insights on successful entrepreneurship for a better world. Is it possible to be a $1B company and be a conscious compassionate leader? Are there ways to create positive impact on humanity and generate high valuation? Today, Dr John Sullivan and I talk about elite performance and the brain. Peak human performance is not about mental toughness and grit. Women’s participation in the tech sector is one gender gap that is unfortunately wide and growing. Born in Dana Point, CA and now working in Sao Paulo Brazil, Fr Ryan is dedicated to being the embodiment of love in action. The mission provides entrepreneurial development in one of the poorest regions of the world. Women and Investment: Create Exponential Growth! Financial Freedom: Rewire Your Money Mind and Create Abundance! Using experience & neuroscience, Hilary rewired her money mind to become financially free. She made discoveries, adopted new beliefs, and developed systems that she fine tuned until they worked perfectly to transform her own financial life. The adventure of a lifetime -- flying underwater in a submarine with wings. From Richard Branson to National Geographic, Deepflight has provided an amazing experience to travel through the water with unprecedented range, speed and agility. Educate + Empower + Restore. It is a great honor to be joined by Fabien Cousteau to discuss the Ocean Learning Center (OLC) and the experience of living 31 Days underwater. It is possible for Health-Tech and biometric data, with insights, to be a ‘service’ that is useful to all humans on a day-to-day basis! In honor of women everywhere, we celebrate and honor the amazing women in our lives. In our talk today, we explore the link between confidence and dealing with negative emotions to live a full and vital life. Steven Kotler's 20yrs of work training individuals and organizations in the use of flow—a non-ordinary state of consciousness with a long track record of improving performance. Doing less to get more! A functional medicine pioneer, Dr Stephanie Daniel & leading wellness coach Sara Plummer Barnard share their tips on how to get better results with less push. Every day, tons of good food is wasted! 20 Billion pounds of cosmetically imperfect or unharvested food are wasted each year. What is AI and Machine Learning? How is this affecting Healthcare? What do you need to know? Today, we are going to discuss 3 trends that you need to be aware of regarding AI and Healthcare. Dr. Peter Joseph is a recently retired emergency physician who says he’s now working on the mother of all emergencies -- climate change. He leads the Marin County chapter of Citizens’ Climate Lobby, a rapidly growing grassroots volunteer organization based in Coronado, California. It’s the biggest revolution you’ve never heard of, and it’s hiding in plain sight—if you know where to look. High performance expert Jamie Wheal’s STEALING FIRE: reveals the widespread use of altered states to achieve ultimate performance. Would you like to feel less stress and more love in your life? We all have the ability to create this today. Catherine will share scientifically proven tools and techniques to master your response to stressful situations and life challenges. Nadine is a French therapist & writer who primarily defines herself as an “explorer of Life”. 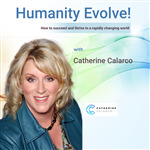 Join host Catherine Calarco and guest Meryl Shaw discuss Humanity Evolve! The shared wisdom of a live journey of personal growth, digital health, leadership and international experience.